Camps for elementary and middle school students (rising K through grade 8) are fun, varied, and educational. For summer 2019, TNCS will again offer 4 weeks of language immersion camps. New this year, we’re expanding our lineup of TNCS teacher-led concept camps. We are also pleased to continue offering a range of third-party specialty camps. We are again hosting 9 full weeks of Art Camp by The Painting Workshop and welcome back some other standard favorites. 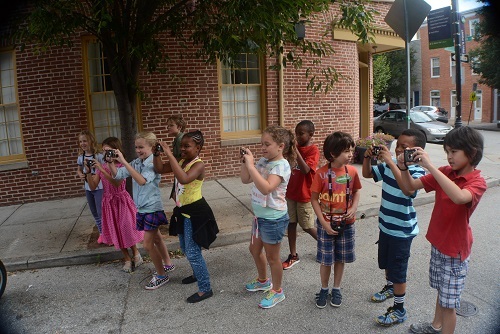 Additionally, we are thrilled to be hosting our third year of American Music Camp, Baltimore. Detailed descriptions of our offerings can be found below. Sign up for Summer Camp 2019! New for summer 2019, we’ve added a number of specialty camps that are managed by familiar TNCS faculty. Ms. Schaffer is offering 2 weeks of camp: Campfire Kids and Books & Cooks. Ms. Sharma and Lin Laoshi will independently run two new exciting cultural camps: Passport to India and Chinese Culture Camp. Please check the eligible ages and camp weeks carefully for specialty camps for rising-K through 8th-grade students; you may not enroll your child in more than one camp in the same week. Note that rising-K students may alternatively enroll in Primary Fun Camp sessions, which run the full 9 weeks of summer camp. Requirements: Students must have at least 6 months instruction on one of the following instruments: violin, viola, cello, bass, piano, or guitar; students must have and bring their own primary instrument (violin, viola, cello, bass, keyboard, guitar) every day. From old-time music from the Appalachian Mountains to traditional Bluegrass, students in AMC Baltimore benefit from learning from faculty who perform American Music in all parts of the country. Students have the opportunity to play in ensembles and learn how to improvise—no improvisation experience needed. American Music Camps have locations throughout the east coast, and AMC Baltimore is the newest addition to the family. While every American Music Camp has traditional American music at its core, each camp location has its own unique experience to offer. AMC Baltimore is proud to include a bucket band and beat boxing in its curriculum, bringing a musical facet that is unique to this region. No matter what your experience level is to American Music, any student will fit right in with tune packets of the jam session tunes sent weeks beforehand to prepare. Each class is taught by world-class faculty and performers from Baltimore and throughout the country. AMC Baltimore offers children who normally study under the Suzuki Method the chance to hone their skills and continue with daily practice while exploring music that is outside the Suzuki Method repertoire. Students are encouraged to apply their hard work in an engaging and fun musical environment. This summer, we are pleased to once again welcome The Painting Workshop to TNCS. Open to children who are entering kindergarten through grade 8, these weekly themed camps will inspire your child to embrace the world of art. The Painting Workshop has been offering fun, lively, quality art classes and workshops in Baltimore since 1995. The Painting Workshop believes that young or old, the art of creating is a joyous, exciting process. They provide guidance and materials for the artistic process to happen, encouraging students to try new things, be inspired by other artists, and find their artistic voice. For more information, visit The Painting Workshop. Let’s take a trip around the world, exploring and creating art as we go. Stop in Australia and discover aboriginal art. Design your own ancient Greek vase. Be inspired by the calligraphy and printmaking of Japan, the Batik textiles of Indonesia, the landscapes of France and Italy. This is art and culture—around the world! Stars, comets, planets, and aliens! Let’s look to the skies for our artistic inspiration! Craft constellations from beads and paper, create planet mobiles, and design and build your own spaceship. From Van Gogh’s Starry Night to our own self-portraits as astronauts, we will use art to express our wonder of the universe. Artists have always found inspiration from the natural world, and birds are no exception. From Chinese scroll paintings of cranes at the river’s edge, to Audubon’s detailed and realistic renderings of all sorts of birds, to Picasso’s white dove drawings—and even Hallmark cards of birds on a branch—we will be inspired to create our own paintings and drawings. We will also try our hand at paper cut-outs, wooden birds, tiny watercolors, birds made from clay and beads, birds crafted out of felt and yarn, and our famous paper-towel-roll owls. Of course, our birds will need birdhouses and environments created for them, whether they are city pigeons, penguins in the Antarctic, or macaws in the rainforest. Join us for this fun week of bird-watching! Week 4: DIY Week: Let’s Create! Do-It-Yourself Week! Join us for this week of exploration as we create all sorts of materials, from slime that is plain or sparkly, to clay that we can mold, to paper that we create from newspaper and string. We will make our own stamps to ink with, learn about batik and other fabric arts, craft elaborate clay beads, and create our own sculptures. Be a part of the time-honored tradition of artists and craftsmen who value the process of making art as much as the final product! Collage is fun! We will craft images from all sorts of materials, including paper, fabric, beads, washi tape, and buttons! We will paint and decorate our own paper to use in collages on canvas and paper, and découpage on boxes and picture frames. Collaboration is a way to work together on art projects, to create elaborate murals, puzzles, sand art, and paintings. Help each other craft materials that we can share to use in a large group project or in our own work. This is a fun week of art projects and inspiration! The world of animals and creatures, real and imagined, is magical and inspiring. Join us as we use art to both represent and interpret the animal world. Learn how to draw and paint dogs and cats, how to envision a unicorn, and design and build imaginary animal habitats (think jungles and the desert!) Camp may include a visit from a friendly pet, or a lesson from Brittany Roger of The Drawing Zoo, who brings reptiles to drawing classes! Join us as we explore the lively and mysterious world of the creatures that share our planet, and those that capture our imagination. Waldo is hidden in a sea of figures. Harry Potter has a magic wand and an invisibility cloak. Red and yellow magically create orange. Let your imagination take flight as we explore the fun and fantastic elements of art. From M.C. Escher’s Tessellations, to Op Art, to our favorite characters like Waldo, Harry Potter, and even Clifford the Big Red Dog, we will take a fresh look at the fun and magic of art! In our busy world, nature offers a place to reflect, observe and imagine. How does light appear in a rainbow, or bouncing off of waves in the ocean? Let’s look at how to draw trees, whether individually or in perspective in a landscape. We will craft clay and plaster animals, paint rocks, make twig sculptures and sponge paintings. We will be inspired by Claude Monet’s Impressionist gardens, Van Gogh’s bright sunflowers, and Andy Goldsworthy’s elaborate earth sculptures. With paintings, drawings, sculpture and crafts, join us to celebrate nature through our art! Environmental science, chemistry, geology, and geography can all be accessed through art. Whether we are making casts of dinosaur bones; combining various ingredients to make volcanos, lava lamps, the best slime, or the most colorful clay; or to see what happens when we drop Mentos into Diet Coke, science is present, and art is the result. This week includes lots of interesting projects, experiments, and fun! All new for summer 2019, this hands-on camp is led by TNCS K/1st teacher Leslie Shaffer. Ms. Shaffer attended culinary school while in college and has experience running after school cooking programs. In Books & Cooks, campers will enjoy reading books related to food and preparing foods that go along with the theme. They will practice measuring and cooking; older campers will be given the opportunity to read aloud from selected books. Children will compile a cookbook of the recipes they cooked during the week. All new for summer 2019, this exciting camp is led by TNCS K/1st teacher Leslie Shaffer. Ms. Shaffer attended sleepaway summer camp in New Hampshire throughout her grade school years, and it was her favorite part of each year. To share this experience with young campers, she is recreating a “sleepaway” day camp experience at TNCS! In Campfire Kids, campers will do camp crafts such as tie-dyeing t-shirts, making friendship bracelets, and beading. They will get outdoors for a big part of each day, learning orienteering on daily neighborhood walks and playing traditional camp games like Capture the Flag. Campers will also grill hot dogs on a griddle and make healthy s’mores with graham crackers, bananas, and sun butter. Although they won’t be sitting around an actual fire, they will learn to sing plenty of campfire songs! All new for summer 2019, this engaging camp is led by TNCS staff member Qin “Monica” Li. In Chinese Culture Camp, campers will explore Chinese culture through arts and crafts, singing and dancing, playing traditional games, and even through their palates! Students will also practice t’ai chi daily, and arts and crafts will include Chinese papercutting, an art Li Laoshi is skilled at. Many of the week’s activities will help students cultivate patience and mindfulness. This camp is a great complement to Chinese Language Immersion Camp (Weeks 3 and 4). However, Culture Camp will be conducted in English, and non-Chinese language speakers are encouraged to join. In TNCS’s Chinese Immersion Summer Camps, students entering grades 1 through 8 can experience Mandarin Chinese. By listening, watching, and learning—and using the language throughout the day in a variety of modes—they will increase their knowledge and improve proficiency. Cultural learning and activities, such as cooking, dance, and drumming, are also a big part of this fun, stimulating environment. Students will be divided into groups based on age and ability in Mandarin Chinese so that instruction can be tailored to individual needs. Sign up for 1 or both weeks! Sign up for one or both weeks. The TNCS Spanish Immersion Summer Camp program for elementary and middle school students offers a fun-filled learning environment where differentiation is built in to daily learning. We offer a challenging and inspiring program to children of different language abilities, from novice to advanced. The entire day will be spent immersed in the Spanish language, experiencing culture through art, literature, cooking, and recreational sports. Back for its second year, Mr. Warren’s upbeat camp focuses on allowing campers free self-expression through music, exploration in set design, pairing dialogue with music and movement, and exploring the technical aspects of the performance stage! Musical theatre is a form of theatrical performance that combines songs, spoken dialogue, acting, and dance. The story and emotional content of a musical—humor, pathos, love, and anger—are communicated through the words, music, movement, and technical aspects of the entertainment as an integrated whole. Although musical theatre overlaps with other theatrical forms like opera and dance, it is distinguished by the equal importance given to the music as compared with the dialogue, movement, and other elements. Parkour Camp & Parkour, Jr.
Parkour, Jr. (Grades K–2): For the younger urban athletes, Parkour offers the same creative obstacle courses to challenge their mental and physical abilities as in Parkour Camp, but tailored to their smaller size and younger age. It’s a great way to help kids change their ideas about fitness while helping them build self-esteem and encouraging them to work hard in a safe and fun environment! A typical day will start with an instructor-led warm-up and conditioning session, followed by learning parkour-related techniques. In addition to skill development, participants will take part in other fun activities and games, culminating at the end of the week with an obstacle course challenge or outdoor training (weather permitting). On the last day of the camp, parents are invited to come watch the Ninja Graduation Ceremony, where aspiring ninjas will show off their newly acquired skills and complete a parkour obstacle course! For more information, and to watch a video about parkour, visit the Urban Evolution website. Parkour Camp (Grades 2–8): Parkour offers creative obstacle courses to challenge your child’s mental and physical abilities. It’s a great way to help kids change their ideas about fitness while helping them build self-esteem and encouraging them to work hard in a safe and fun environment! A typical day will start with an instructor-led warm-up and conditioning session, followed by learning parkour-related techniques. In addition to skill development, participants will take part in other fun activities and games, culminating at the end of the week with an obstacle course challenge or outdoor training (weather permitting). The Play-Well program teaches children about engineering and architecture, using a project based learning approach. Campers build structural, and motorized, projects using Lego® materials. Students work individually and in groups; and they are encouraged to use their own creativity beyond the core projects. It is an interactive and fun way to gain knowledge! All new for summer 2019, this fun and engaging camp is led by TNCS elementary and middle school math and science teacher Nameeta Sharma. Grab your “passports” and let Ms. Sharma guide you through some of the rich artistic, cultural, and culinary traditions India has to offer. Campers will also learn about Indian geography, “visit” landmarks like the Taj Mahal, and practice dance steps to popular Bollywood hits. Join actor, storyteller, and teaching artist Alexandra Hewett for a week with The Bard in Elizabethan England. Ms. Hewett is a veteran TNCS Theatre Camp teacher and also teaches at the Chesapeake Shakespeare Company. In Shakespeare Theatre Camp, campers will read sonnets, act out scenes from A Midsummer Night’s Dream, and enjoy their very own version of The Globe Theatre. A field trip to tour the Chesapeake Shakespeare Company is also planned. For more information about the Chesapeake Shakespeare Company, visit the Chesapeake Shakespeare Company website. TNCS offers Before Care beginning at 7:30 am as well as After Care until 6:00 pm. You can add these options during online registration. Let us provide lunch! You can add our healthy, delicious school lunch during online registration.